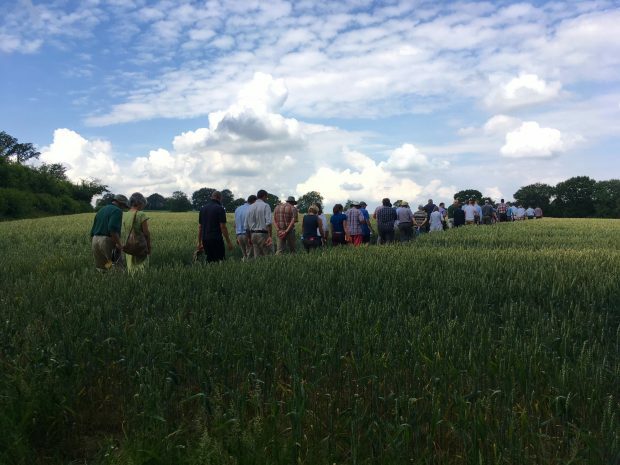 An event organised by Natural England and partners this month saw more than sixty farmers and land managers from across Kent descend upon a local farm to learn more about sustainable farming practices and natural capital. Little Pix Hall Farm Manager, William Steel welcomed farmers to a knowledge exchange day, demonstrating the positive impacts that conservation agriculture has brought to the farm and the local High Wealden landscape over the past twenty years. A morning walk was packed with a number of stops that showed the huge amounts of work that William Steel has undertaken. This includes utilising manure from the beef herd as fertiliser on arable crops and the use of hedgerows to encourage a wide variety of insects to thrive. Looking ahead, William has big plans to reduce nitrogen, phosphorus and pesticides use by 25% over the next 10 years. Little Pix Hall is leading the way in achieving both financial and environmental sustainability. The work undertaken here is a brilliant example of how Catchment Sensitive Farming works in practice. Water, air and all Natural Capital is something everyone benefits from. At Natural England we are working hard to harness our natural resources now and for future generations. Natural capital is a way of defining the wide range of benefits we get from nature which make human life possible. It includes all forms of resources from the environment including minerals, water, air, sunlight, heat, plants, animals, and other organic matter. Farmers using sustainable practices want to get the most out of natural capital when using it and preserve those resources for future generations. Catchment Sensitive Farming is a successful partnership between Defra, the Environment Agency and Natural England. We work together with farmers and organisations in priority areas across England to improve water and air quality. Since 2006, we have worked with over 20,000 farms and helped farmers take more than 100,000 positive actions to reduce pollution. In 2018, as part of Defra’s Clean Air Strategy, we are now also working with the agricultural industry to improve air quality. Read more about free expert advice, training and grant support, helping farmers take voluntary action to improve the environment and their farm business.